Exercise bikes are an ideal home exercise equipment giving a funway to get your cardio workout. They provide a superb way for a beginner to get started exercising. 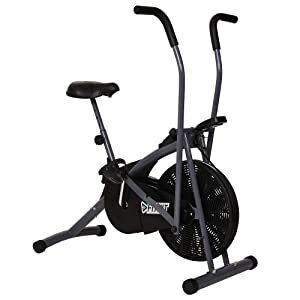 Exercise bikes are fantastic exercise devices for all levels of motivated health and fitness seekers, including beginners.There are two style of exercise bikes, either upright (pedals below the user) or recumbent (pedals in front of the user). They are popular for people who want a regular overall body workout without having to have many types of exercise equipment. Modern exercise bikes, unlike the older exercise bikes, are smooth and quiet. Recumbent exercise bikes are so comfortable and easy to use that eventually you can do workouts giving you results like you’ve spent hours a day on a stair-stepper.Exercise bikes come in all shapes, sizes and many price ranges. Most exercise bikes are available with numerous levels of resistance. They give you the benefits of a higher-impact cardio workout without the strain, excellent for people with bad knees for example. 3 What to Consider Before Buying Exercise Cycles/Bikes ? Designed to encourage regular workouts for enhancing the health benefits, improving the mobility of the joints and to build-up muscles Fitkit FK600 Steel Airbike is the best design by all standards. It is stylish, sleek and compact. In sync with the changing demands and requirements of the users this bike has adjustable seat and user friendly pedals to avoid slippage . Offering the perfect matching of electronics, mechanics and ergonomics this new design with the concept of 2019 has very low access. It has a 5 function display system that shows time, speed, distance, scan and calories, handle bar for comfort and a flywheel of 3 kg. Fitkit FK600 Steel Airbike is suitable for the users of varied sizes and heights. It comes with maximum user weight of 100 kg. Bringing in new dimensions to the concept of exercise bikes, the Cardio Max JSB HF73 Exercise Bike with retro style, compact dimensions and powerful exercising features makes exercising more of fun than a monotonous routine. The benefits offered are par excellence and one can work out the entire body in the comfort of the home listening to the favourite songs or watching the best loved channels. Available in dimensions of 92 x 51 x 110.5 cm it can be installed in required spaces without resulting in space constrictions. This exercise bike has magnetic braking resistance system and flywheel of 4 kg mass for magical benefits to the body. The muscles can be built-up, mobility of the joints improved and resistance levels increased after regular sweating out! Well equipped with 8 levels of tension controller it offers 100% satisfaction for the novice to the professionals! The benefits can be analysed at a glance via the LCD display. With speed meter; calorie display; timer and pulse measurement display it makes it easier to check the improvements as well. The precise pulse measurement is possible via hand grip pulse monitoring. Cardio Max JSB HF73 Exercise Bike is designed for regular consistent use. The maximum user weight permitted is 100 kg. The new Fitkit FK500 Steel Airbike provides you a fabulous work out experience with this power packed and unique exercise bike which is fully loaded with amazing features. Fitkit FK500 Steel Airbike is equipped with an adjustable seat which makes the seating arrangement more comfortable. It is also fitted with anti slip wide base and user friendly pedals for ease of use . An easy-to-read 5 functions display display is also there in this bike. This display supports recovery feature including settings for total distance, time, speed, scan and calories.This product is constructed out of steel material. The maximum user weight supported by this bike is 100 kg. While the flywheel of this bike is 3 kg. 5 Function display : distance , time, calories, speed and scan. This season Cardio Max has introduced a feature packed machine for today’s workaholics. This bike comes with the latest technology with a choice between basic and advanced consoles whereby it fits your pocket as well as your exercising regime. 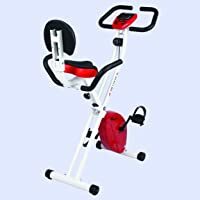 In today’s world of rush, people never get to spend time in a gym to exercise but now Cardio Max JSB HF78 magnetic Exercise Bike comes as a real surprise to them. Be at home and look fit. Ultra smooth and quiet operation adds to the better usage of the device. You can attain dynamic workouts with the availability of extra wide stride. The unit measures body fat and hand pulse which proves better workout results. This Cardio Max JSB HF78 magnetic Exercise Bike comes with large comfortable footplates for added comfort. Low impact is facilitated for total body work out. It supports 16 level tension controller. Provided display shows time, speed, distance, calories etc. Cardio Max JSB HF78 magnetic Exercise Bike is available with dimensions of 103x53x119 and a maximum user weight of 100 kg. Above all, this unit is a perfect exercising tool in your home. It helps in shaping your body and you get maximum results. The unit takes care of the comfort level of the users, whereby, you get satisfactory outputs. Make your own gym at your own home with the new Powermax Fitness BX-110SX Bike. This compact machine facilitates easy storage. You can easily place it in any corner in your living room or your bedroom. This stylish exercise bike helps you to remain slim and healthy. It has a wide variety of features that will make your routine exercises interesting and exciting. It is provided with padded seat that gives you great comfort while exercising. In addition, it consists of a drive system with Ribbed Belt Transmission. The Powermax Fitness BX-110SX Bike, is specially designed for those of you who work hard to go a mile ahead in life. It consists of an LCD display that shows you the time, speed, distance, calories burned and more. This information gives you valuable feedback to keep you motivated to exercise harder. Besides, the adjustable resistance system offers you a very smooth and quiet workout session. The body of Powermax Fitness BX-110SX is made of sturdy high quality steel that ensure durability. Further, it has a flywheel of weight 4 kg. Lifelinehas been keen in launching a new model exercise bikes they have recently designed and introduced the new Lifeline Exercise Bike 103BS to the market. Compact design has been used for construction of the bike and the manufacturer has taken much care for reducing the overall weight of the unit for convenient storage and easy use of the device. This product can be used even at homes. Lifeline Exercise Bike 103BS has been featured with a manual tension knob for adjusting the strength and an electronic meter display. You can view the exact time while doing the exercises. Time, speed and scan can be known from the unit. Total distance travelled and power utilized can also be known for actual progress in your workouts. Cockatoo Imported OB-01 Exercise Bike is the right choice for those of you who are determined. It helps you keep perfectly in shape and size besides maintaining your health and happiness. This model is very compact and hence can be easily accommodated anywhere in your home. This stylish exercise bike effectively motivates you to strive harder giving you active feedback just like a personal trainer would. It is your best companion to help you burn that extra bit of calories and maintain that size zero shape. This smart model consists of large pedals and also has the adjustable resistance with elliptical motion. Further, it provides you a LCD display console on the front that shows distance, time, speed and calories etc. 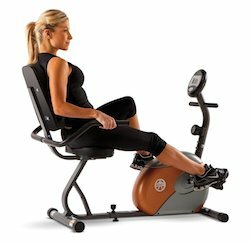 The Cockatoo Imported OB-01 Exercise Bike makes you exercise regimen interesting. In addition it consists of a multi position handle bar. The seat is very comfortable to use and is vertically, forward and backward adjustable. The height of the set can also be adjusted. Cardio Max JSB HF115 Exercise Bike will help you a lot to build your body and also makes you fit. This exercise bike is made of high quality frame that makes it a highly durable one. This model is available in stunning silver and black colour. Cardio Max JSB HF115 Exercise Bike comes with a very comfortable seat that can be adjusted forward and backwards. This exercise bike includes 8 level Tension controller. The LCD display of this stylish bike gives you the feedback of Time, Distance, Speed, Pulse rate and Calories. Resistance type of the system is Magnetic resistance. Straight handle bar of the bike can be adjusted accordingly. The included wheels of the unit helps to move this unit from one place to another easily. Non Skid Pedals with Adjustable foot straps gives you much grip during your workouts. Total supported dimensions are 100X60X158 cm. The maximum user weight supported by this exercise bike is 100kg. All together this bike is a very good one for your daily exercises. 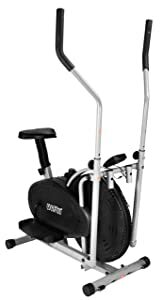 Powermax Fitness BU-205 Exercise Cycle is a simple device designed to do the work outs comfortably. Nowadays people are more careful about the fitness of the body and this product is a convenient option. The device is for home use and it does not require external power for operation. The seat and handle Bar of the device is easily adjustable. Computerized meter display is integrated with the product. The display of the device displays Speed, Distance, Time, Calories, and Scan. The maximum user weight that this Powermax Fitness BU-205 Exercise Cycle can hold is 100 kg. 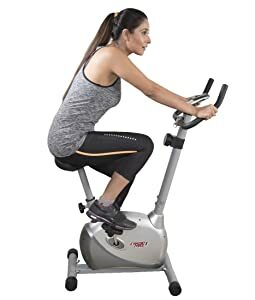 Body Gym, the prominent company in supplying top quality exercise bikes has designed a high quality equipment named as Body Gym Stamina Air Bike. The included programs of this bike help in working out all your muscles and burn all the fats from the body. This Upright Exercise Bikes comes with a very strong frame. 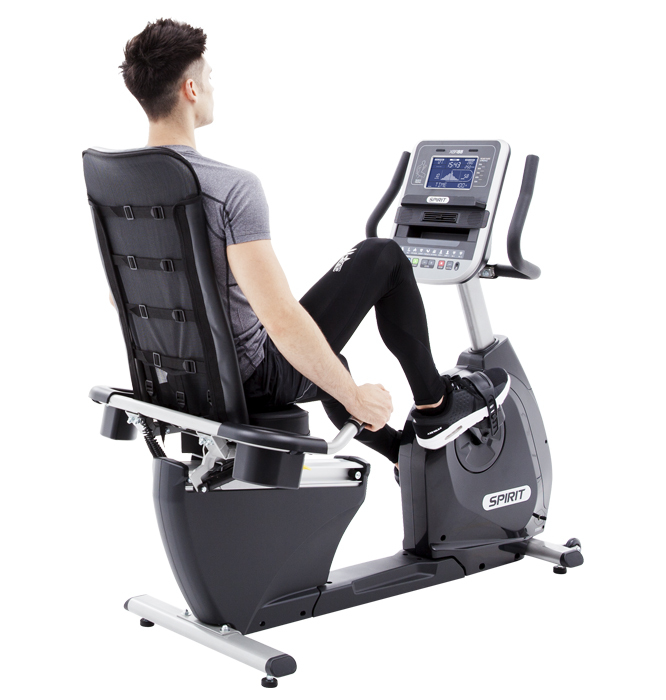 Body Gym Stamina Air Bike comes with 5 Window monitor display. The product also supports manual resistance. The contact pulse rate sensor helps in pulse rate function. This exercise bike has Pedal Spacing that helps in reducing the joint stress. To get the feedback of the Time, Distance, Speed, Calories, and Pulse this model has a 5 Window monitor display. The built in transportation wheels makes it very easy to move this unit from one place to another. Total weight of this unit is 17 kg. Maximum user weight in this machine is 90 kg. All in this entire model is a very perfect one for your work out. An upright exercise bike looks like a regular road bike with a vertical orientation. Upright bike allows for more movement, such as riding while standing on the pedals, or in a racing position, which can give you a more strenuous workout, but also be harder on your back. Meanwhile, on a recumbent bike, the rider is seated against a backrest, with legs out in front.This way, your body is positioned in a reclining posture and your legs will hang out in front of you so you can reach the bike pedals contrary to the upright type where your legs simply hang down. What to Consider Before Buying Exercise Cycles/Bikes ? The other aspect you must take into consideration is the price range according to your budget. There are basically three price ranges: under $500, between $500 and $1000, and over $1000. The first category is the best if you do not plan on using you bike frequently because their quality probably is not very high. While it is possible to get quality bikes for this price, it will not usually be that way, so do not purchase it unless you are on a strict budget. 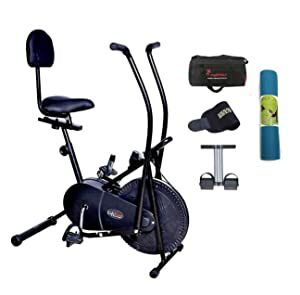 In the second category, you can get a high quality and resistant bike for this price that usually include magnetic based resistance and grade console that will give you specific information about your workout. Foot straps, built in workout programs and a monitor for your heart rate are other usual features. An important factor to take into consideration is resistance and you can choose between three different kinds of resistance: direct tension, air resistance and magnetic resistance. Magnetic resistance is usually considered to be the best and most elaborated kind and also offers a wider range of levels. It is also less noisy and offers a better feel while pedaling. 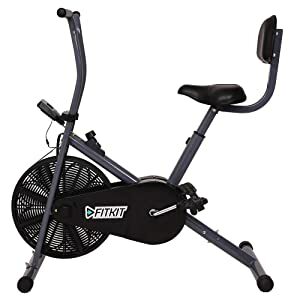 In these machines, the direct tension allows you to manually adjust resistance, while air resistance is provided when pedaling against an airflow that comes from the fan. The last is probably the best category, with bikes designed to be used in fitness clubs and by the advanced home exercisers. Keep in mind that generally when it comes to exercise machines you actually get a valuable product so you will have to do a bit of research if you want to get a good one that you will use for a long time. These are the basic and most relevant factors to consider when choosing a bike, the type and the price that you are willing to pay. There are also some other features that you may want to consider when selecting a stationary bicycle. With so many digital consoles fitted to them, the majority of bikes offer information about the speed, the distance you have traveled, and the time you have been working out. As many recumbent bike reviews point out, if the bike is very sophisticated, you can also have features such as the calories you have burned, the resistance level and heart rate. Whether you go for a bike with a quality display that also includes many preset workout schedules or one that is more simple will depend after all on your personal preferences. It is equally important that you know just how much are you going to use your stationary bicycle. If you have just begun exercising and are not very sure if you will use it a lot, you should probably save your money and consider a cheaper model. However, if you know you will be using the bike very often since you already exercise regularly, you should probably invest more and buy a machine that will last. Exercise machines usually come with a wide range of warranties that can last from 3 months to a lifetime if we consider all the bicycle parts. Some parts can have a 180 days warranty, the electronic parts up to one year and the frame can last for an entire lifetime. Generally you should take into consideration that the longer the warranty the bigger the chances of a very high quality bike. Choosing the best exercise bicycle is crucial and it will always depend on your personal needs and preferences. However, you should know that higher priced bikes are usually the most resistant and will help you obtain all the benefits they can offer you. Exercise bike are extremely popular both at home and in the gym. The simple reason is they are a great way to get and stay in shape. The following are just a few of the reasons that you should have your own exercise bike and how you can benefit from having your very own. Its a commonly known fact that most people do not get enough exercise each day. Much of society has become more and more technological and people across the globe have become more sedentary than every before, most of the day people are sat in front of a PC. If you have your own stationary exercise bike at home, you have a great way for getting exercise, even while you are sitting down. You can simply put the bike in front of your television and ride the bike while watching your favourite television show. Doing this on a regular basis will go a long way to providing a healthy lifestyle. Exercising indoors has it advantages especially during winter when of course the weather outside is rotten. Even when the wind and rain are pounding outside you can still get a good workout. Since many people in western world are very sedentary, more and more people are at risk for heart problems. One great cardio vascular activity that can help prevent health issues such as heart disease is biking. For people that are overweight the bike is a good exercise as there is no impact load on your joints. Cycling combined with a healthy diet can definitely help you protect your heart. So, while you are riding your bike, you’ll actually be adding some years to your life. Which has to be a good thing.